Poverty, physical abuse, suicide, and addiction have all reached epidemic proportions in South Dakota’s Indian reservations. Lakota, Dakota, and Nakota children and young adults are disproportionately affected by these trends. Historical trauma, chronically underfunded federal programs, and broken promises on the part of the US government have resulted in gaping health, educational, and economic disparities compared to the general population. Award-winning Lakota writer Joseph Marshall III, who himself was raised on the Rosebud Indian Reservation in South Dakota, wants to give voice to the hundreds of thousands of native children currently suffering. 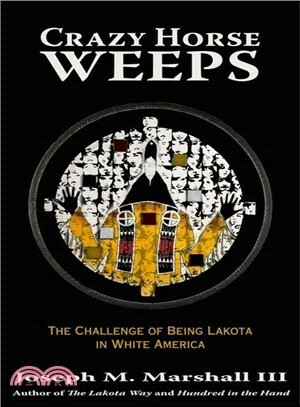 Crazy Horse Weeps offers a thorough historical overview of how South Dakota reservations have arrived at these tragic circumstances. Through personal narratives and first hand accounts from children and their families, he shows how discrimination, a disorganized tribal government, and a devastating dissolution of Lakota culture by the U.S. government have transformed the landscape of Native American life. These extraordinary challenges, Marshall argues, can be overcome. Using his extensive experience in traditional Lakota wisdom, he proposes a return to traditional tribal values and outlines a plan for a hopeful future. Joseph M. Marshall III was born and raised on the Rosebud Sioux Reservation and holds a PhD from the reservation university, which he helped to establish. The award-winning author of ten books, including Hundred in the Hand, The Lakota Way, and The Long Knives are Crying, he has also contributed to various publications and written several screenplays. His first language is Lakota, he handcrafts primitive Lakota bows and arrows, and he is a specialist in wilderness survival. Marshall's work as a cultural and historical consultant can be seen and heard in the Turner Network Television and Dreamworks epic television miniseries Into the West.